"Fortwilliam" redirects here. For places named Fort William, see Fort William (disambiguation). Castle is one of the ten district electoral areas in Belfast, Northern Ireland. Located in the north of the city, the district elects six members to Belfast City Council and contains the wards of Bellevue, Cavehill, Chichester Park, Duncairn, Fortwilliam and Innisfayle. Castle, along with the neighbouring Court and Oldpark districts and parts of Newtownabbey Borough Council, forms the Belfast North constituencies for the Northern Ireland Assembly and UK Parliament. The district is bound to the east by the Victoria Channel, to the north by Newtownabbey Borough Council and Belfast Lough, to the south by North Street and to the west by the Cavehill Road and Oldpark Road. 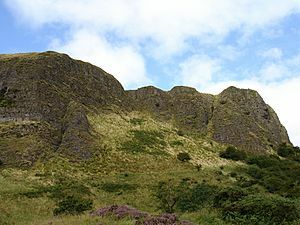 The district takes its name from Belfast Castle which is located on Cavehill in the north of the district, while the southern section of the district is part of the city centre and forms one of the Belfast's main cultural areas, known as the Cathedral Quarter. The east of the area also contains the Port of Belfast. Castle is served by the M2 and M5 motorways and the Yorkgate railway station. Castle is one of the most mixed areas in the city, with just over half of the district's population being Protestant at the 2001 Census. This has resulted in the construction of a number of peace lines, for example along the Whitewell Road. Castle was created for the 1985 local elections. 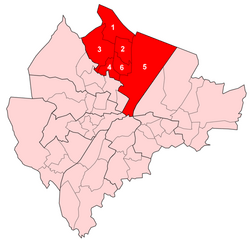 All six wards came from the former Area H, with only the Cliftonville ward and northern section of the Waterworks ward omitted from the new district. One of the district's six wards, Castleview, was renamed Innisfayle in 2014. Castle (District Electoral Area) Facts for Kids. Kiddle Encyclopedia.